This location in Monument Valley is called “North Window” where your view is looking northward between these two massive mesas (that’s Elephant Butte on the left) towards East Mitten and Stagecoach buttes off in the distance and Utah. Click here to view a map of the park. 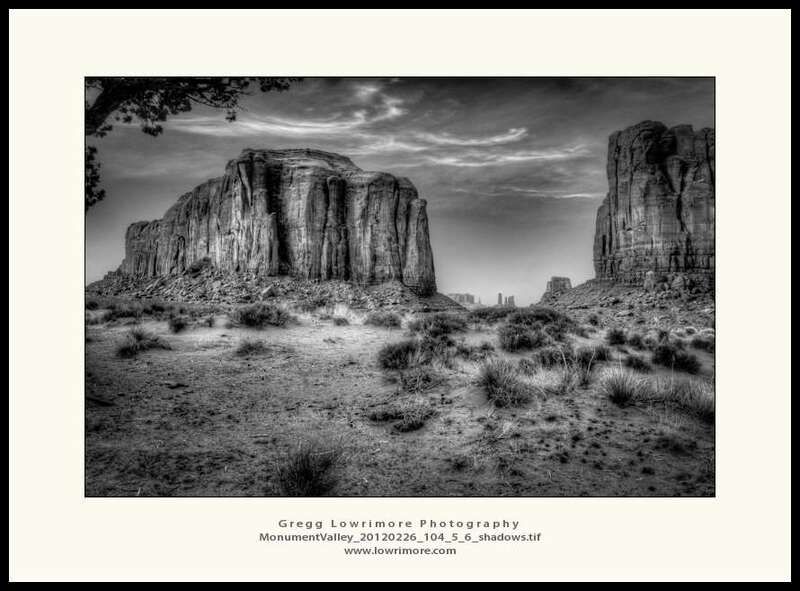 Such monolithic mesas are very hard to capture on “film” and still show their massiveness. 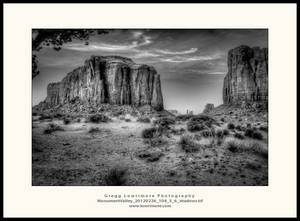 By framing the subjects a little bit, I hoped to bridge that shortcoming of film and show just how large these mesas are. Monument Valley is symbolic with the American West. Numerous films have used Monument Valley as their ‘soundstage’ and many good articles have been written outlining the movies, directors (John Ford) and actors (John Wayne) that have made this national park so iconic over the years. A quick Google search brought me this article from the LA Times. For this sunset outing, Steve and I hired David, a local Navajo Native American, who drove us around the park in the company Suburban. He took us to a few of his select spots ideal for sunset photography. And with his guidance, we were allowed to venture off the beaten path and onto protected (and sometimes sacred) grounds to see and photograph what most people don’t get to see in this park. Turns out David was also the guide for the Indiana Jones film crew for the Egyptian desert scene where Harrison Ford is looking down into the “snake pit” (“I hate snakes! Why’d it have to be snakes?”) and showed Steve and I the backside of a huge mesa with a natural amphitheater including a natural arch at the top of the theater. David said that was the hole into the “snake pit” scene and the theater was used for the interior filming of that scene…. tourist trivia to excite the numnuts photographers? Dunno, but David was an excellent, very personable guide and we both appreciated his knowledge of the park and his guidance to help us get our sunset shots. Without David, we would have had to stay on the main loop road and not even been allowed to walk off the road into the brush to get unique shots like this. A guide service is highly recommended if you should venture into this National Park someday, they can get you access into restricted areas and they will teach you more about what you are seeing inside the park. 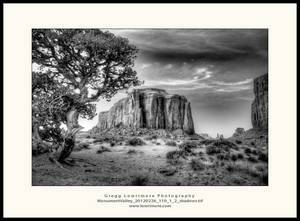 Posted in HDR, Landscapes, Shoots and tagged B&W, black and white. HDR, desert, Monument Valley, Navajo, North Window, southwest, tribal area by greggl with 1 comment. 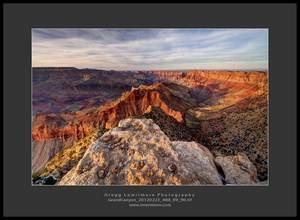 One of our first stops on my recent Southwest Photo trip with Steve Parker and Kash Mohammadi, we to Lipan Point Overlook at the Grand Canyon. This is one of many, many images being processed from this area now. Stay tuned by subscribing to this blog to the left here and you’ll be sure to be notified when more imagery is published. Posted in HDR, Landscapes and tagged Arizona, Grand Canyon, Lipan Point Overlook, southwest, sunset by greggl with no comments yet.